I took a little hiatus last week from blogging because like many this was Spring Break and although my grade schooler and high schooler had school my college kids were off and I spent a lot of time with my daughter this week playing catch up. My Son worked full time so he wasn't around as much but did celebrate his 23rd birthday this week. He's very excited and waiting very impatiently for his birthday present. He's been asking for a new bicycle. I know sounds like something you would buy your 10 year old! We all have fairly new bikes and he never really wanted one until recently. He has been trying to focus a little more on his fitness lately. We had to order one because he's so tall and they didn't have one that would fit him. I am hoping it comes today and so is HE! This week is going to be our first nice warm one so I hope we can go for a few bike rides! My week started on a high note with Wesley's birthday and ended on a high note with a Stampin' Bee for my Create With M.E. team! Friday night we got together to fellowship and stamp! A few years ago at a Stampin' Up! leadership conference I heard someone relate stamping to a quilting bee and it really stuck wtih me. a Quilting bee is women getting together to fellowship and do something creative that they love together. So since then my team meetings have been called Stampin' Bee's. I love these gals! We really have a good time laughing and eating and stamping! So first we started with a little eating....ok a lot of eating! Here we are up in the kitchen enjoying a feast. Everyone outdid themselves bringing great fingerfoods. It was all yummy! Then we went downstairs to my studio for some STAMPING! We had so much fun. Linda prepared her box for us to make that I blogged last week here. I will show you how these are made later this week so stay tuned it was FUN! We also played with our new two step stampset "Awash With Flowers" that will be on special in April. I will be showing that card on Thursday when you too can order a set! We did a great fun technique on this card so you won't want to miss it. But what I will show you today was a fun magnet/chalkboard that we all created. I first saw this idea on Angie Kennedy's blog. I then stepped it up with some of our chalkboard vinyl that we cut with our big shot dies. This was fun! These are made with Metal Flashing shingles I bought from the local home improvement store. You get 10 in a package and they are very economical. We covered them with some Pumpkin pie Designer Series paper punched a couple holes with our crop-a-dile (which easily punches through metal like buttah). Then we cut some of the chalkboard vinyl that Stampin' Up! sells in sheets of 14 x 24" 2 sheets per package. We used both the top note die and the scallop square die. Then the flowers are made by Faux Sueding some perfect plum cardstock and creating some beautiful flowers and attaching the leaves from the sweet pea felt flowers from the occassion minis. Lastly we glued on a super strong magnet button with some crystal effects or our great tombo multi adhesive works too. These magnets are ones I had made a few weeks ago playing with different products. I love these super stong magnets because as you can see you can even magnet over the vinyl. I really can not remember where I found the stong magnet buttons but it was at some local craft store. Here is Brenda, Lana and Minon working on their boxes. We really had a fun time. There is still time to join the Create With M.E. 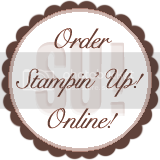 team to get all the GREAT benefits Stampin' Up! is offering in March. You must sign up before the end of the month to take advantage of these specials. Not only do you get a great discount on some fabulous stamping supplies you also get to pick any stampset of your choice out of the Big Idea book & catalog and you get to be a part of a great team! If you want to join my team and earn these benefits, get all your supplies at a discount from this point and even make some money to help out your family you can sign up on my website Create With M.E. Click on Join now and my password is: createwithme I can't wait to welcome you to my team. You do not need to be local to be a part of my team. I have girls on my team from various parts of the country. Don't want to join Stampin' Up! but need some supplies delivered right to your doorstep? Recycling retired supplies~Dress them up with DSP! I had received them from my upline at an event last year and never got them used before they retired. One of my favorite things that originally drew me to Stampin' Up! 10 years ago (I was a customer long before I was a demonstrator) was that everything was color coordinated. So since I no longer have the matching ribbon and paper and I tend not to use retired supplies in my business ;-) I didn't have a use for these buttons anymore. Long before I stamped I used to sew. One thing I did was I made my own button for the kids clothes so they matched their little outfits. You would buy a blank and cover it with a circle of fabric. So why not cover these buttons I thought! I started by punching out a 1 3/8" circle of DSP (Designer Series Paper) for the large size button. Next I wanted the paper to be as thin as possible so since I have been playing around with the faux suede technique I thought I would try it with DSP. It worked! Then I wanted to get it still as soft as possible so the paper would wrap smoothly around my button. So I covered it with the Tombo Mono Multi liquid Glue. It worked like a charm. Now it's time to put it on a project. Well, I didn't get that far but I have used one in the center of a "sueded" flower. I punched the New Extra Large Fancy Flower Punch out of Melon Mambo and faux sueded it but only pulled the petals up leaving the center still intact. Very Cute! I hope you enjoyed todays little tip and you will try it on your own projects soon.